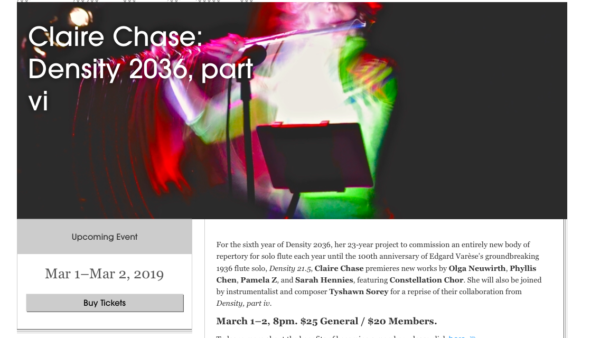 For the sixth year of Density 2036, her 23-year project to commission an entirely new body of repertory for solo flute each year until the 100th anniversary of Edgard Varèse’s groundbreaking 1936 flute solo, Density 21.5, Claire Chase premieres new works by Olga Neuwirth, Phyllis Chen, Pamela Z, and Sarah Hennies, featuring Constellation Chor. She will also be joined by instrumentalist and composer Tyshawn Sorey for a reprise of their collaboration from Density, part iv. March 1–2, 8pm. $25 General / $20 Members.